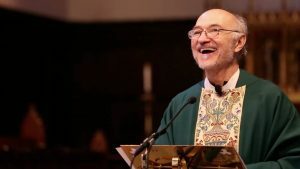 The 2019 Spirituality and Justice Award will be given to the Rev. Dr. David Killian on Sunday, April 28 during the 10:30 am service. Below is information about events that weekend, and about David. David will preach at 5:00 pm service, followed by the monthly appetizer potluck hosted by the Celtic Community in the Guild Room from 6:00-7:00 pm. Contact Jane Ross for more information about the potluck. Coffee at 9:30 am with David in the Guild Room. 10:30 Service with David preaching and bestowal of Spirituality and Justice award. Social Hour following the service until 1:00pm with David. The Spirituality and Justice award is given to a person whose deep spirituality is expressed in work for social justice. The Award was first given in 1998 to Bishop Barbara C. Harris and was awarded over the years to Bishop Desmond Tutu, Marian Wright Edelman, Dr. Peter Farmer, and Byron Rushing. As the second-longest serving rector in the 125-year history of All Saints Parish from 1992 to 2012, David established the Ruah Interfaith Spirituality Institute that organized lectures, seminars and retreats that attracted Christians, Jews, Muslims, Hindus, Buddhists and others to deepen their own spirituality and encounter spiritual practices in faiths other than their own. As President of the Brookline Interfaith Clergy Association he worked with spiritual leaders of all faiths on issues of social justice. He led All Saints Parish to participate in the Greater Boston Interfaith Organization (GBIO) to work for racial and economic justice. In 2010 the Ruah Spirituality Institute merged with Cooperative Metropolitan Ministries (CMM), where David is today president of the Board. CMM, established in 1966, is the oldest interfaith social justice organization in the greater Boston area. CMM works to reduce youth violence in crime-prone communities, promote affordable housing in Boston and provide leadership training for youth and adults of different faiths. Ordained a Roman Catholic priest in the Paulist Fathers, David served at Boston’s Paulist Center, in an African-American parish in Washington, D.C., and in campus ministry at Ohio State University. He was received as a priest into the Episcopal Church in 1988 at Grace Church in Newton, his sponsoring parish, and was interim rector at St. Dunstan’s Church in Dover, St. Michael’s Church in Marblehead, and the Church of the Good Shepherd in Watertown. He served on the Diocesan Council and Standing Committee. For over 20 years he was a member of the Board and editor of the newsletter of the Massachusetts Episcopal Clergy Association (MECA). Currently he is chaplain to postulants and candidates for ordination in the Episcopal Diocese of Massachusetts and Bridge Priest at St. John’s Episcopal Church in Newton as well as President of the Massachusetts Bible Society, founded in 1809 to promote Biblical education and literacy. For a time he worked for the City of Boston’s Neighborhood Development and Employment Agency, the Commonwealth of Massachusetts, and as executive director of Interfaith Counseling Service, Inc.
All are invited to join in these celebrations. For more information contact the parish office.